Call it a 1-2, 1-2 punch. Or how about two scoops of high-level high school hockey? The hockey gods have graced us with boys’ and girls’ games involving the No. 1 and 2-ranked teams in a span of about 15 hours. At 7 p.m. Friday at Braemar Ice Arena, No. 2 Blake heads to No. 1 Edina for the second of what should be three meetings this season. The top-ranked Hornets won 4-3 at Blake in mid-November. The rematch Friday gives both teams an excellent tune up with the postseason fast approaching. That’s where their likely third meeting comes into play. Both power programs reside in Class 2A, Section 6. Only one can go to the state tournament. Or neither, if another top Section 6 team -- fourth-ranked Wayzata -- has its way. Blake (17-2) won seven Class 1A titles, then opted up to Class 2A for the 2017-18 season. Edina (17-3) defeated the Bears in the section final en route to winning its second consecutive state title. The teams are littered with Division I-committed players. Blake offers Julia Blum, Addie Burton, Izzy Daniel, Lily Delianedis, Grace Vojta and sisters Audrey and Madeline Wethington. 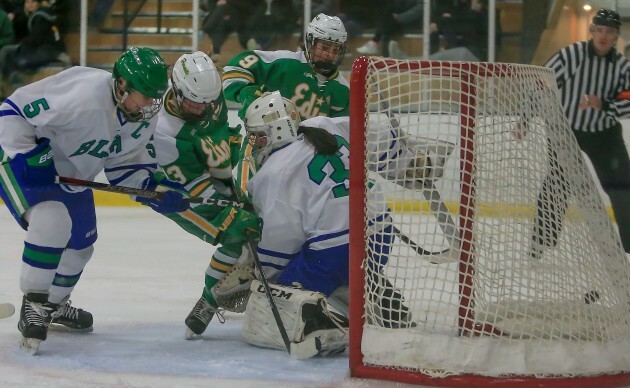 Edina counters with CC Bowlby, Hannah Chorske, Katie Davis, sisters Tella and Vivian Jungels, Annie Kuehl, Kylie Roberts and Mallory Uihlein. Saturday brings us Hockey Day Minnesota, the 13th annual Fox Sports North creation that celebrates the sport from preps to pros. Bemidji is the host community this time around. At 9:30 a.m., No. 1 Minnetonka (16-0-1) faces No. 2 Andover (16-0-1) on an outdoor rink. Projected game time temperature: About 21 degrees below zero. Texted Bemidji boys’ coach Eric Monsrud on Friday afternoon about the weather affecting game times. “Nothing I’m aware of,” he wrote back. Defending state champion Minnetonka returned standouts this season such as goalie Charlie Glockner, defensemen Grant Docter and Josh Luedtke and forwards Jack Bayless and Teddy Lagerback. Andover was a double-overtime loss from reaching its first state tournament last season. The Huskies' opportunity window remains open with players such as Nick Dainty, Eric Chartier, Ben Fritsinger, Luke Kron and Charlie Schoen. Enjoy the hockey, one and all.